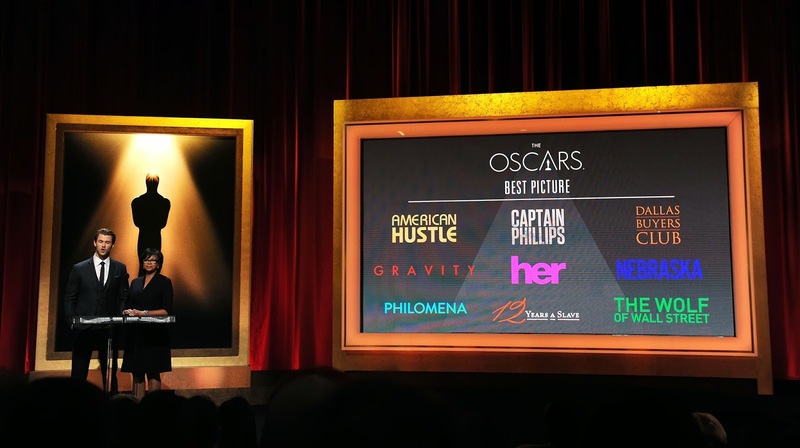 -No, I'm not going to do a full post on the Oscar nominations. For one thing, by the time I get around to doing them, like eight hours after the nominations, they're old news. And for another thing, I've found that people don't generally respond to awards coverage. Well, definitely not in the last few years I've done it, anyway. -Plus, I can't really add anything new. The Tom Hanks snub sucked. American Hustle seems to be the buzz, and I'm going to reserve judgement until I see the film (possibly next week), but is this The King's Speech of this year? I reckon it is totally going to True Grit things - have all those nominations but no awards to show for it. -Also, The Great Gatsby getting no love in the song section hurt, too. WTF is Alone Yet Not Alone? -Anyway, so here's the story of nominations night: they were at 2.30am, and even though I was supposed to get sleep before and after then, I was up all night sick. However, I managed to contain the stomach flu for the nominations, but I had to do silent fist pumps so I wouldn't wake the house (like I did when Rooney Mara got nominated). There were a lot of silent fist pumps. First, for Jonah Hill. I knew it was going to happen (but sadface for Daniel Bruhl, though). Then for Sally Hawkins, who I knew I was right for predicting - remember when everyone thought it wouldn't happen? Then for Before Midnight getting a screenplay nod. And then for my girl Amy Adams for finally breaking through into the lead category. Started from the bottom now you here, Amy. -And then along came Best Actor. When Christian Bale got called, I was like "no, no, no, no, no, dear god no that is Leo's spot". And then it happened. All of my hopes and dreams came true in that one moment. I didn't even pay attention to the rest of the nominations. -But "Academy Award nominee Matthew McConaughey" sounds perfect, doesn't it? -Anyway, this wasn't the only time of the week that Leo made my hopes and dreams come true. Of course, the Golden Globes - a.k.a the only awards show I'll be able to watch fully this year - happened and he got the award there, too. Ah, it was perfection. 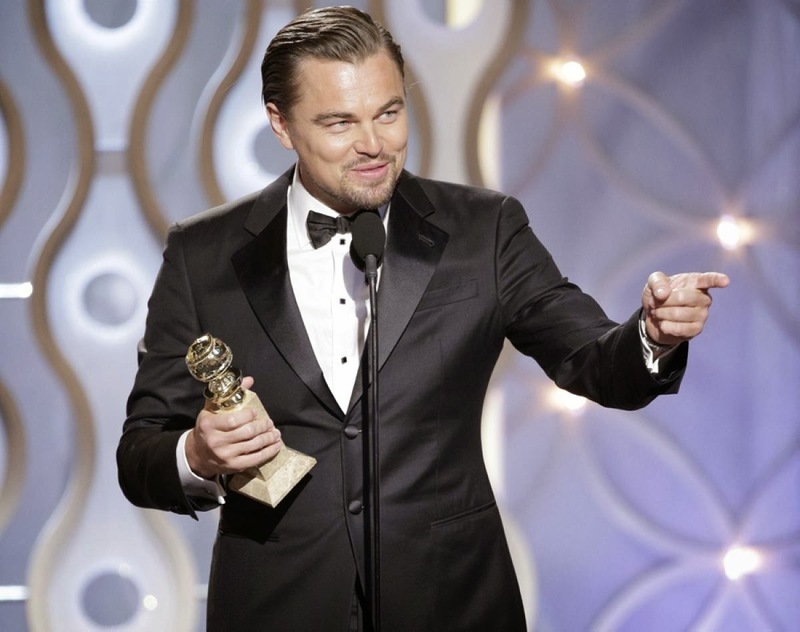 -The Golden Globes were very entertaining. Was very happy to see Matty M, Amy Adams, Jared Leto, Alfonso Cuaron and Steve McQueen get awards. Plus, Amy and Tina were gold. Can't really say too much other than that - just flip through my Twitter feed for my uncensored, unedited thoughts. -But I must say, I keep watching Matty M's speech because I love hearing him say "alright, alright, alriiiiiight" and "go get it, McConaughey". Like I swear that's going to be my new catchphrase for awards season: "go get it, McConaughey". I seriously need to stop saying it in real life situations. -I really wish we could just have Jessica Chastain giving Matthew McConaughey awards all season. Their cute friendship makes me all the more excited about Interstellar. -It would seem that Jennifer Lawrence backlash is the new black right now. Now, I love her as a person. I loved her in Winter's Bone and particularly The Hunger Games: Catching Fire. I'm still a little angry about her winning for Silver Linings Playbook, as I don't think she ever owned her character. And it appears that the same thing happens with American Hustle. I dunno - she has an exceptionally good filmography and she's an exceptionally good performer, but she seems to be getting an awful lot of praise for movies she's not necessarily right for. If she wins that Oscar this year, the backlash will be terrible. But I think that's going to go to Lupita Nyong'o, who broke my heart in 12 Years a Slave. Well, at least I hope it does. -On the opposite end of the spectrum, and awards getter that I'm loving at the moment is Barkhad Abdi. Maybe I'm a sucker for stories like his, but it is so awesome how he does literally one film and then gets nominated for an Oscar. He's really sweet, too. -I've been catching up on 2013 films, with films like Short Term 12 (man, y'all were right, such a great film), Rush (I liked it, a bit sad Daniel Bruhl didn't get nommed but no big loss), Dallas Buyers Club (go get it, McConaughey), 12 Years a Slave (yeah...I've never cried so much in my life. Steve McQueen has the most perfect filmography of anyone), and...The Canyons, which I will probably write a post about in the next week or so. Man, that was an experience. -The next and final installment in my "money" series will take a look at Side Effects and Blue Jasmine, but I'm just waiting for Blue Jasmine to come out on DVD so I can watch it again. And soak up the amazingness of Cate Blanchett and Sally Hawkins. -And in non-movie related news, I got my exam results back. I managed to achieve Level 3 with Merit endorsed (which I suppose is like a solid B-grade/A- for you Americans), which I was told at the start of the year I couldn't do because I was Head Girl. Ha. Also managed to get Excellence endorsed in Level 3 English (solid A+ grade), getting Excellences in everything I did apart from my damn Othello essay, which I got Merit in. And I also got Merit endorsed in Drama. And yeah, that's high school completely done. I didn't fail anything last year, which was also quite the achievement. I got my acceptance letter into Canterbury and have to scrape together so much money - uni is so hard and I haven't even gone yet! -Oh crap, just realised the SAG awards are tomorrow. I won't be watching, as I have work, but I don't really see the point as Leo isn't nominated anyway. Alas, my quick predictions would be: Best Ensemble - probably American Hustle since everyone loves it, but judging by only having Jennifer Lawrence nominated, this could well go to 12 Years a Slave (as it should); Best Actor - I imagine this is going to Matthew McConaughey, but there could always be a spoiler from Bruce Dern; Best Actress - Cate Blanchett, no doubt; Best Supporting Actor - Jared Leto, no doubt; Best Supporting Actress - most likely Lupita Nyong'o - I only think Jennifer Lawrence's chances would be helped if the rest of her cast was individually nominated. -And make sure you listen to the Across the Universe podcast, where the Chicks with Accents discuss/cry over The Wolf of Wall Street. It's beautiful. What's been going on in your cinematic lives lately? It seems everyone has cooled or soured on RUSH but I really was bummed about Brühl's omission from the nominees. I feel this is the most award friendly film he'll be in for some time, and was so happy to see him recognised. I don't really remember Rush passing with a lot of buzz until Daniel Bruhl became a serious contender, which is strange because it was quite a good movie. Such a shame that Bruhl didn't get in, because yes, it is the most awards friendly film he'll be in! I will say that 12 Years A Slave is the first time that I've cried in a Steve McQueen film, but it's my least favourite of his films so far. His films, though technically brilliant and very brave, always leave me a bit cold. I wish I could get as excited about them as everyone else. At least you don't have to explain to your friends why Shame is one of your most favourite films ever. People just don't understand. 12 Years is probably my least favourite films of his too, but it is probably his best in terms of reaching a wide audience, telling a story that needs to be told etc etc etc. Very jealous of him. Ah, that podcast ep was the best! I did see that! They're so cute. It makes me so much more excited to see what they get up to in Interstellar. Ah yes, her fanbase is ridiculous. Tumblr basically is the site of Jennifer Lawrence. I miss when Jennifer was nominated for Winter's Bone and she was cute and funny and refreshing. Now she's just getting a bit old because of her bloody fanbase. Lupita will win that Oscar. She actually deserves it. I thought the same thing when Christian Bale's name was called during the Oscar announcement. 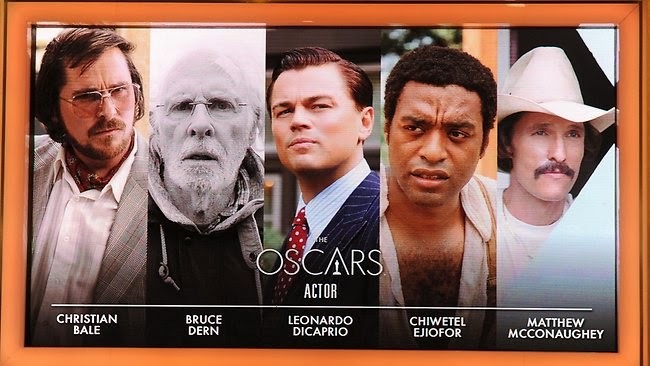 I'm glad he and Leo made it in, but I would've preferred Tom Hanks getting Bale's spot. Ooh, Side Effects. I really need to rewatch that.